My fascination with claymation can most probably be traced back to the mid-Eighties when I had somewhat of an obsession with (now) cult British TV programme The Trap Door. Over 30-years later, animation, and in particular stop-motion, still amazes me and I love when filmmakers do something new and inventive with the technique. 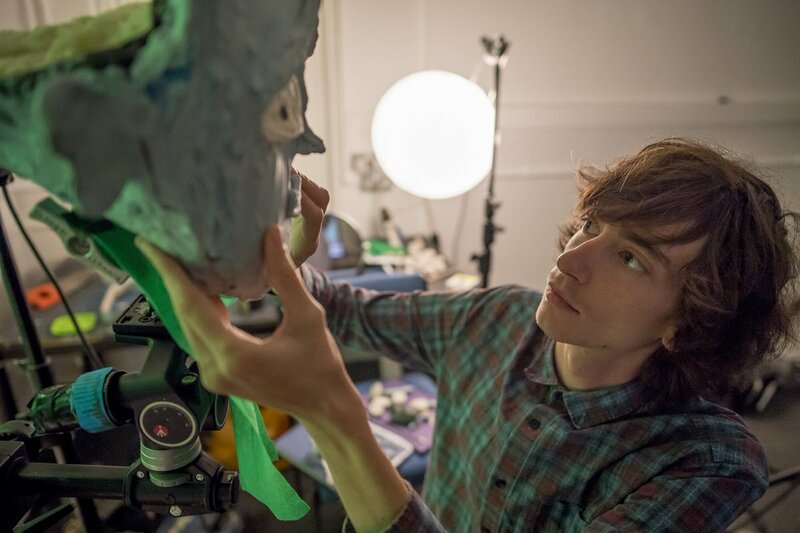 One such director recently blowing my mind is NFTS graduate Sam Gainsborough, with his film Facing It. I’d been lucky enough to see a version of the short when it was a still a work-in-progress and it was clear this was something special. A mixed-media stop-motion/live-action hybrid looking at how relationships mould us as people, it’s one of the most exciting shorts I’ve seen on the festival circuit in recent times. Sam joins us to discuss the incredible craft involved in creating his short and what he intends to do with this inventive technique next. Though the distinct aesthetic of Facing It is sure to be the main focus for all that watch it, it’s a film that revolves around a hugely relatable storyline, what can you tell us about how that narrative originated and what do you hope someone takes away from a viewing of the film? I wanted to make a film about how a relationship can affect the way we live our lives. Facing It explores the character’s relationship with his parents but it could be about friends, lovers, anyone really. I just wanted to make a film that inspired people to think and to ask themselves whether they’re living the way they want to. When Louisa Wood, my writer, and I started working on the script the first thing we wrote on the page was “repression will destroy you”, identifying that we wanted a main character who would be seen to bottle up their emotions rather than living true to themselves. We wanted to make a film that celebrates everyone’s flaws and internal struggle, no one’s perfect after all. I remember first seeing your film when it was a work-in-progress and I was completely blown away by what an original piece of filmmaking it is, what made you decide to take this visual approach with it and can you explain to our readers exactly how you created it? Thanks! That’s really nice to hear. I had the idea for the technique several years ago when I was making papier-mâché masks for some friends for a party and it was something that sat with me for years. When I went to the NFTS I always knew in the back of my mind that I wanted to try out this weird mixed-media mask technique so there was never really a question about the style. The technique itself is quite a difficult thing to explain which is why we’ve made a Making-Of (see below), which goes into detail and hopefully makes it clear. In total we used about half a tonne of plasticine. Essentially we shot the film in live action and pixellation and then separately shot the character’s faces in the studio against a green-screen, almost rotoscoping the footage we had already shot. This meant matching the lighting by eye, tracking frame by frame in stop-motion, and really hoping that it would work. The heads were made of plasticine, life-size, and in total we used about half a tonne of plasticine. Well, the intention was that they would be life-sized but often the scale ended up closer to double! We also were lucky enough to shoot the stop-motion in the same room where Nick Park started making Wallace and Gromit – A Grand Day Out. It was really cool for me to be working in the same room that saw the creation of a film I found so inspiring as a child. How do you think the film would differ if it was totally stop-motion, without the human actors? Well we tried to write a story that could only work through this technique specifically because it’s about how our own perceptions of people change depending on how we feel about them and how we feel about the real world. The film is very much set in reality but it’s all about the way the main character feels about everyone else, and as such the animation technique augments reality through his eyes to relay how he emotionally interacts with the world. This visible layer of reality is an important part of the story that would be lost if the entire film was stop-motion. Those feelings are the things that are animated; we are seeing the world through his unique goggles. He feels that his parents are these emotionless rock-like characters so they’re animated to look like gargoyles. Whereas he sees everyone else in the world as being effortlessly happy so they’re animated fluidly with lots of colour. But at the end of the day the feelings he has are false, what lies underneath that is reality, real people (with painted hands for some reason!). I think essentially I feel that this visible layer of reality is an important part of the story that would be lost if the entire film was stop-motion animated. I don’t remember ever seeing a live-action/claymation film of this scale before, so I’m assuming making it you had to really be adaptable and think on your feet. How much of the film’s success came down to the pre-production and how much of it came down to improvising during the shoot? I was really lucky that the people I was working with were very trusting. Before going into production I had made a small prototype for the technique which was very rough around the edges but at the end of the day, it showed that what we wanted to do was possible. That said, when we jumped into a crazy live action shoot with loads of actors, dogs, and different locations, my Cinematographer, Bruno Grilo and I quickly realised that we had to trust our gut and improvise. Amazingly after I’d animated the first shot we were very confident that the rest of the film would work. As much as it was a gruelling challenge to get through the huge amount of claymation, it was always exciting. I do wish that there was one character wearing real glasses, I don’t know why I didn’t think of that at the time. If you could go back in time, knowing what you know now, would you do anything differently? HA. Yes. It was such a crazy film to make as none of us really knew if it would even work until we had the first few shots finished. That meant the process of making it was really experimental and it was all a bit of a stab in the dark. There are many things that we have learnt that meant we could have made the film in half the time. But that’s the fun of this type of filmmaking when you don’t know exactly how it’s going to turn out. I do wish that there was one character wearing real glasses, I don’t know why I didn’t think of that at the time. Or a hat. The film is currently touring festivals, how have audiences been reacting to it? It’s been amazing. I lived in this film for such a long time that by the end of production I really didn’t think that anyone else was going to understand it. But the first screening, when it was still a complete work in progress, went down really well and everyone connected with the story, which for me was the main point of making the film in the first place. So far it’s gone down really well with audiences, it’s been amazing. It’s really amazing that it’s already playing all over the world and it’s not just something that’s rolling around in my head every day. I’m really keen to use the same technique but using stop-motion puppets. Do you have any further plans to play with this aesthetic more and what are you working on next? Yes. My mind is boggling with different things to do, this technique really felt like the beginning of a visual style that I really want to develop. I’m really keen to use the same technique but using stop-motion puppets. At the moment I’m focusing on writing the next film and I’m collaborating with some different artists. I really want to think about other ways to tell stories, and it’s been especially inspiring getting to attend different film festivals and seeing different types of filmmaking from all over the world. Oh wow, that looks amazing. When does it stop the touring circuit? It is indeed! Not sure when it finishes its festival run, but if you reach out to Sam he might be able to let you know.